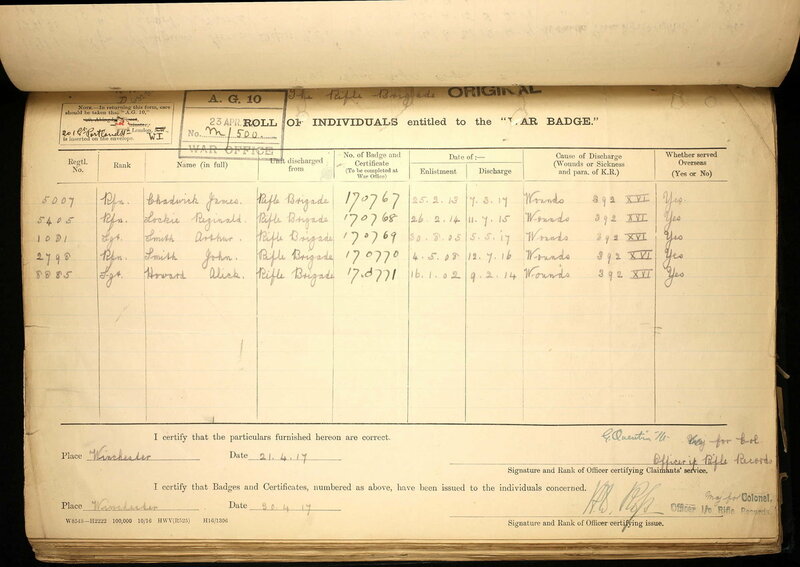 Would anybody be able to check their Rifle Brigade Chronicles to see if there is an Arthur M Smith listed as a sergeant or staff sergeant in the 1st Battalion, Rifle Brigade . 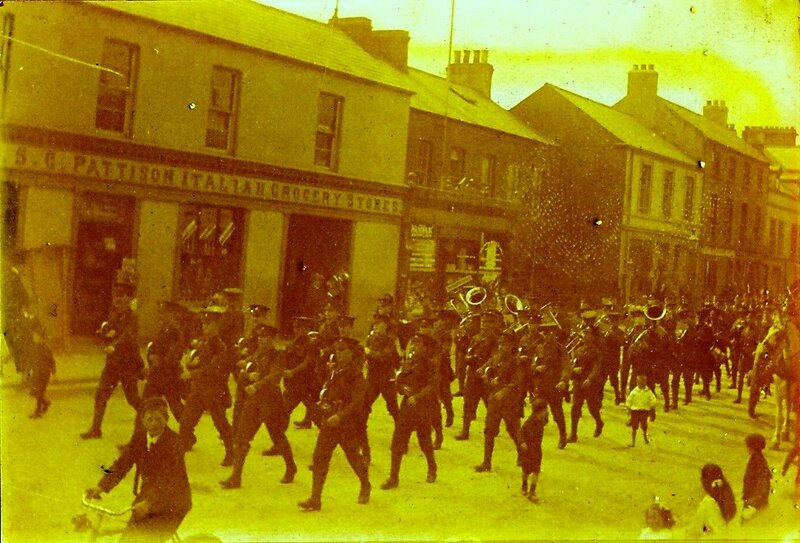 I believe that Arthur (my great grandfather) enlisted in 1904 (bugler) and was posted to Belfast where he married my great grandmother in 1907 . Arthur's middle name is Meadows. He was working as a postman in 1912 (on the reserve list) in Surrey and was called back up in 1914 at the outbreak of war. Arthur went off the radar after the birth of his last child in 1920 , left his family and no records have been found indicating what happened to him. The only death I can find in the Registers Index that has an Age at Death valid for a birth in 1886 as well as First Name(s) Arthur M, is for an Arthur M. SMITH, died aged 44yrs, death registered in Q3 1931 in Stockport Registration District. Searching for First Name(s) of plain Arthur with a plausible Age at Death brought back pages of hits . What's your source for Arthur working as a postman in Surrey? Higher up the information given was he was a postman working at Warrenpoint in Ulster. Be aware that Richmond Barracks are in Dublin, not Richmond-upon-Thames, Surrey. Richmond Barracks census returns for 1911 are available on-line, but unfortunately the men in the barracks are listed only by their initials. It looks like only those not living communally (e.g. ? in married quarters) have their full names on the Return. Some of these initials only pages do also include what appear to be Service Numbers, but by no means all. I couldn't find any rifleman with initials "A.M.S." and there were too many "A.S."'s to chase through, particularly as you hypothesise Arthur was already out of the battalion by this time. Andy - this is likely to interest us too, with several rifles battalions in Ireland for 1911, but the search tool takes some getting use to! Granddaughter Mary Pauline THOMPSON, 3yrs old, is presumably the child of Patrick Sr's son-in-law "Pte Thomason" (sic) mentioned in the "Good Man, Frank!" newspaper article. Based on tales from my grandfather about going to school in Warrenpoint, it's presumed that Annie Smith returned to Warrenpoint at this point. My grandfather tongue in cheek mentioned that his father (Arthur Smith) was a teacher at Harrow school,clearly not true, but could tie in with the 1st Battalion being billeted at Harrow prior to departing for France. 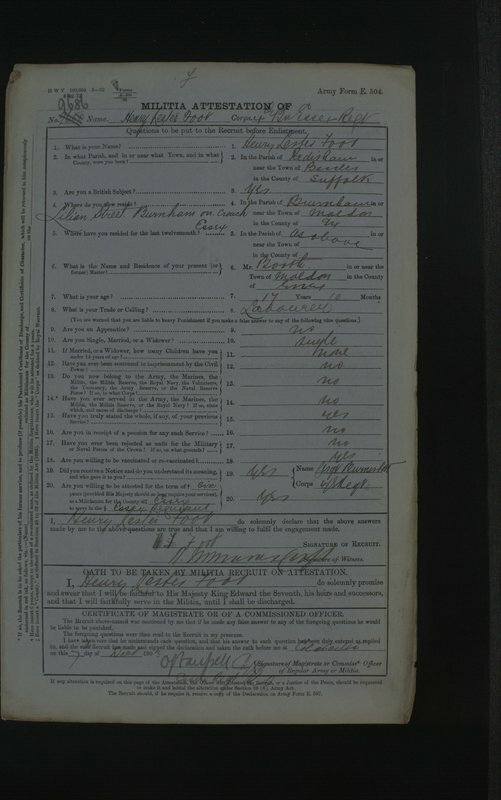 In 1922 Annie Smith registered birth of daughter, father not listed, residence 27 Rose Street. My grandfather says that Arthur wanted to move to find work but that his wife didn't want to go. Again based on tales from my grandfather, he claimed there are Meadow Smiths in Australia. I managed to locate Arthur's sister in New Zealand, she left the Uk C1920. Wedding certs from some of Arthur's children list him as a sergeant and staff sergeant in the RIfle Brigade, I'm unable to verify this. My grandfather would not talk much about his father. We looked at 6726 as a possible, entered the war in 23.8.14 and became a POW 26.8.14 Not sure if this ties in with the birth of Clara Evelyn Smith C1918. POW most likely in camp Sennelager, again don't know when they were released and returned home. A puzzle why the Smith family ended up in Sheerness, I'd hypothesized that perhaps Arthur Smith had returned injured and was posted to Sheerness to train new recruits. 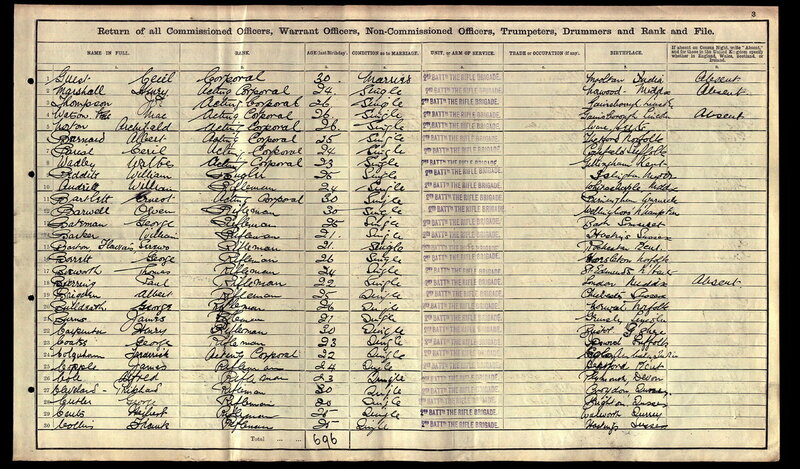 I think you have found Henry Lester Foot in the 1911 census returns, good work, very well done ! Being unable to find Arthur in the 1901 census , I did wonder if he had joined the regiment at a young age, so is he 6726 and did his children exaggerate his rank on their wedding certificates, the other children had him listed as a postman, civil servant (clerk), grammar school teacher ! or is he actually a staff sergeant / sergeant. The occupation concerte Artiste elocutionist suggests he was still involved in music ,bugler past ! Searched high and low for him for a year now and the only lead I have is a postal service record for 1928, with no region listed. I've managed to trace all the people listed in the Good man Frank article, which has a few inaccuracies, it's been a very very interesting experience piecing it all together. Patrick Morgan is my great great grandfather, lived in Church Lane, Warrenpoint. I can email a copy of this book, the copyright has expired but I am wary of posting it on the forum. Would he have been a rifleman at such an early age ? He was listed as a bugler in 1907 when he was 21. Wasn't there a minimum age for serving overseas ? If you were placed on the reserve list would you have been given the prefix letter B. Apart from serving in Ireland i have no evidence that Arthur Smith served in France, only that he didn't register the birth of his daughter in August 1914, which suggests he was called up. Quite a conundrum, teacher at Harrow?? maybe because for the 4 days they were in Harrow the 1st encamped on the school's football fields, well 3 days really as they left Harrow at 2.34 am on the 4th day. Certainly seem to be quite a few family lore inconsistencies. The B prefix was given to old soldiers that had left the Army and re-enlisted where there original number had been re-issued to someone else. However you say that he was in the reserves which means he would have kept his original number, as previously stated this Prefix has a lot of inconsistencies attached, i.e a lot of New Army men were given B numbers also, a lot. My grandad did tell some good stories ! There's no chance whatsoever his father was a teacher, but interesting that he mentioned Harrow, i can think of no other reason other than his father passing through Harrow on the way to war. With two daughters mentioning the rank of sergeant, I was curious to see if there are any references to an A Smith in the chronicles. If not, I think I'm going to have to put this one to bed and move on. I have been unable to find any reference to him in the Chronicles, if he was a sportsman there might have been a chance. Any smith that comes up is the usual Rifleman Smith, no initials. I will take at look at the Rifle Brigade Association Journals to see if he attended and OCA meetings or Regimental dinners however unlikely this might seem as he seems to have disappeared off the scene. I do wonder if he served overseas in the war, he may have been recalled to the colours but then served in the 5th or 6th, this happened with a good few old riflemen, hence no medal index card etc. That Irish Census would take some looking at, and as he was seemingly in the Reserves at that time!! Compare to the 2nd in India at the time of the census. When I started this search I came across service number 1081, rank sergeant. At that time I didn't have the wedding records so discounted it based on the rank. I've taken a look at the medal card, it's not clear but it looks like 2nd battalion with the date of entry into the war supporting this. I think you told me that last year, my memory is failing me, sorry ! Been looking at Henry Lester Foot, lots of info on him ! Found his attestation papers, he joined the 4th Battalion Essex Regt 7/12/1903 service number (9686) and then transferred to the Rifle Brigade 19/01/1904 , ironically on Arthur's birthday. His service number was 107. Gives you an idea on what service numbers were issued in 1904. The RB's service number third series began in early Jan 1904 and certainly no earlier than 28 Dec 1903. Do you have a birth date for Bugler Foot? That would be useful. If Arthur Smith, born 1886, joined up as a Boy Bugler, that would be circa 1900. SN in range ~7000 - 8000 in the second series (give or take). If he enlisted in the first half of 1900, he would have just completed his 12 years before the war started. If he did not join as a Boy, then we would be looking at earliest approx 1904. SN in range approx 1-650 in the third series (give or take). Plus he would still have been on Reserve in 1914. Not all the buglers were Boys. Also he did not necessarily enlist at the earliest age possible. Looks like he has gone in via the Militia. A not unusual way of putting your toe in the water of service life without initially committing to 12 years. The equivalent of entry via the Special Reserve post 1908 - see the Mother Site for more info on this. 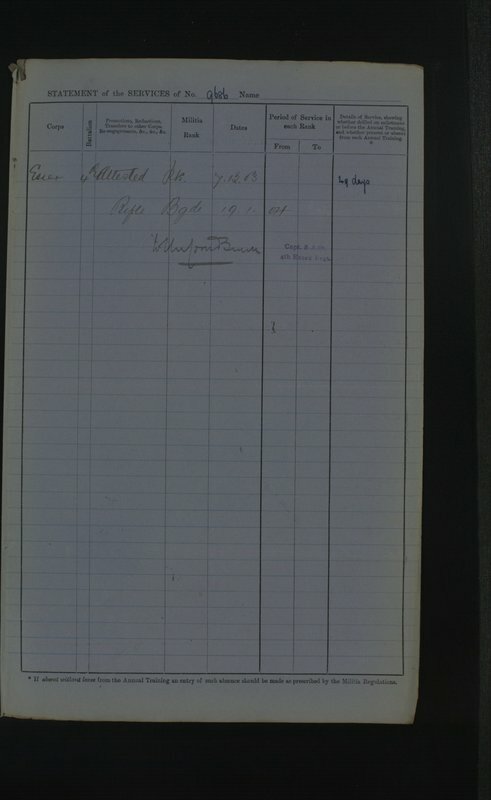 The attestation papers say H.L.F was 17 years and 10 months old when he joined the militia so that would make his birth date around the start of February 1886, his birth was registered 4th quarter 1886. Say if Arthur joined in 1904, was his initial service period 7 years and then 5 on the reserve ?, this fits in with his postal service starting in 1912 and the birth certificate of his daughter in 1914 which had him listed as both a bugler in the rifle brigade and a postman. 1903/904 was at a period where regular enlistments were changing - enlistment terms were running at 3 & 9yrs and then moved over over to 7&5 years (I haven''t got the exact dates to hand). The exact breakdown of service varied but the 12 years total remained. I have a KRRC Regular enlisted in the Militia March 1902 and then took the plunge transferring to the Regulars in 1/KRRC in Oct 1902. Terms were 3 and 9. As Craig says, the terms changed during the period we're looking at. I'll continue delving in my archive for a KRRC/RB Regular enlistment c.1904 for which I have a full document set. Just a thought, if you entered via the Militia, how long would you have to commit to the Militia. I'm wondering if Arthur Smith did the same and possibly explains why he is missing in the 1901 census. What would be the nearest Militia to Kingston Upon Thames, Surrey ? Might be worth my while looking to see if he went down this route. Once a man committed to enlist as a Regular, any Militia obligation would be cancelled out. Apart from the initial training period, the militia were part-time soldiers holding down civilian jobs. Militia members would still show up in 1901 census, though a small number volunteered to serve in the Boer War. Further information on the militia and the Special Reserve is widely available in cyberspace - e.g. on the Mother Site (= The Long Long Trail) as I suggested earlier. 4th Essex (1st West Essex Militia) had HQ at Warley some 15 miles from Burnham-on-Crouch. They were merged with 3rd Essex as part of the 1908 Haldane Reforms with the merged battalion then becoming part of the Special Reserve. I seem to remember a topic on a drill hall in Kingston within the last year or so, though it could easily have been a VF/TF rifle volunteer unit of course. If you search, you might find this quite easily. 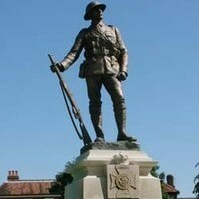 The East Surrey Regt is the county infantry regiment local to Kingston-upon-Thames. Its two militia battalions were 1st and 3rd Royal Surrey Regiment of Militia. In the 1905 Army List, both battalions are headquartered at Kingston. I'll leave this line of inquiry for you to pursue though - it does not seem promising to me. Thanks Mark, I'll have a go. If nothing turns up I'm going to conclude that Arthur Smith at some point was posted to Sheerness and trained the recruits.